It’s raining, and I have breakfast at the McDonalds next door – three Egg McMuffins with sausage and cheese. And Coke. Yum. 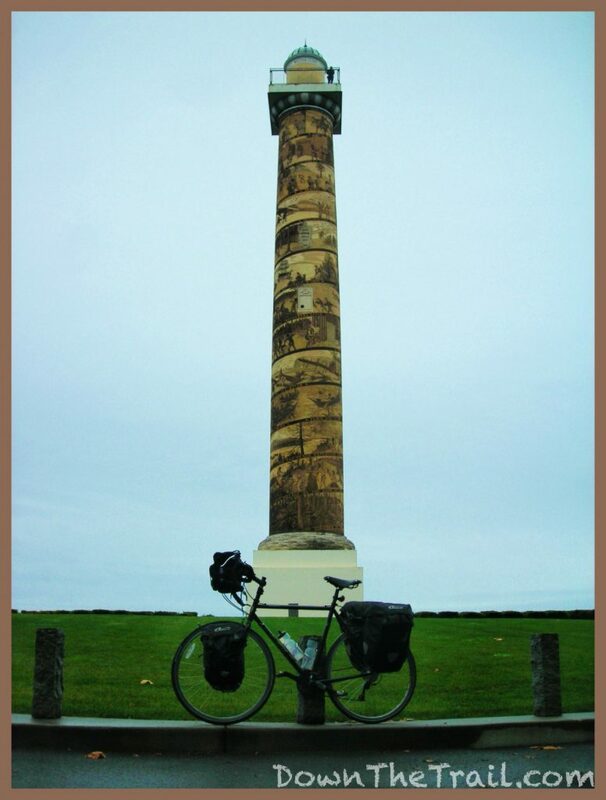 Before leaving town I’m set on seeing the Astoria Column, which is like a big lighthouse that sits at the peak of the tallest hill in the area. I ride all the way up to it – steep, but not so bad. Astoria sits on somewhat of a peninsula, and I actually save a little distance by cutting straight across it, rather than circumnavigating the town along the coast. The climb is energizing, with a fun little anticlimax. 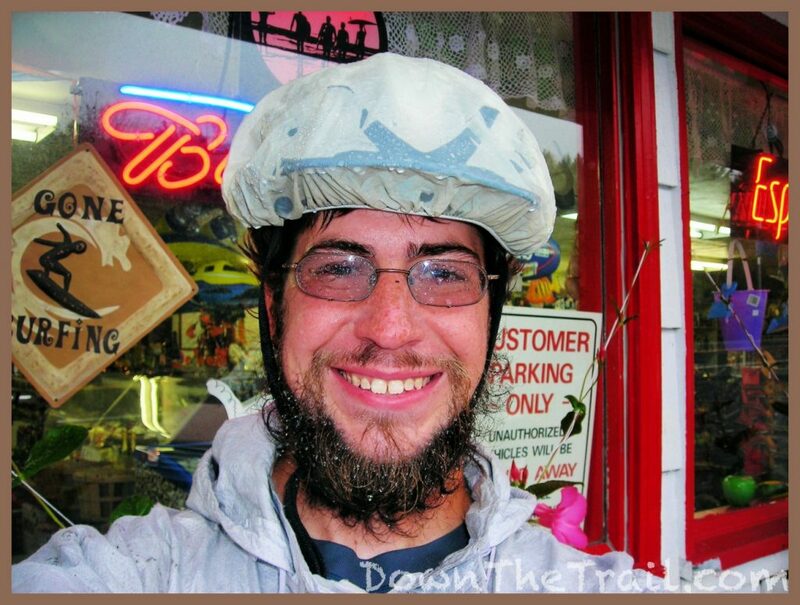 Astoria is technically the end of the Adventure Cycling TransAmerica Trail from here to Yorktown VA. The column has a spiral of murals painted on it, depicting scenes of local history. There’s a door at the base, and inside there’s a dizzying, winding staircase to the top. I count 173 steps – as if the ride to the top of the hill wasn’t enough of a workout. The experience reminds me of the lighthouse on top of Mount Greylock, Massachusetts. 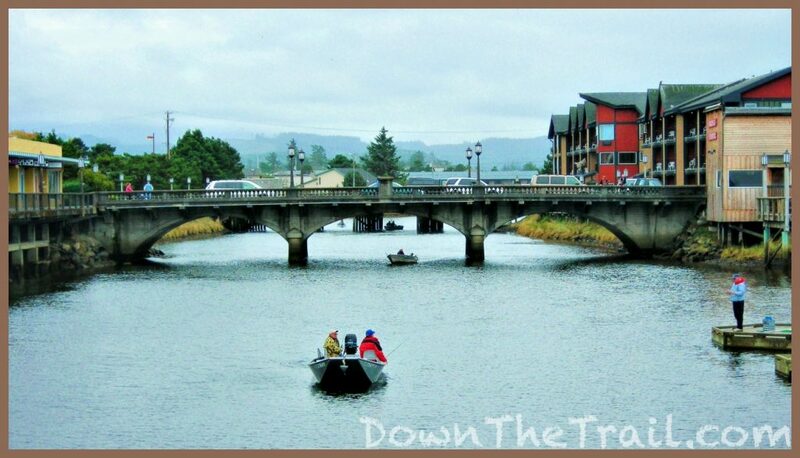 Even on this cloudy day, the view is amazing… the sea-faring town with it’s picturesque, colorful homes, the broad mouth of the Columbia River, and the bridge that spans it, here at the far northwest corner of Oregon. 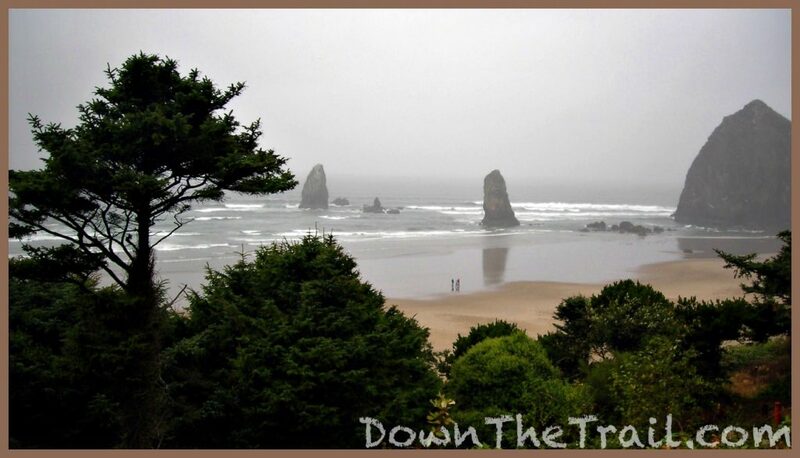 A neat little fact to give you a feel for the area – Astoria is where they filmed The Goonies! I can’t see any golf courses from atop the tower. The rain checked out for an intermission when I left the McDonalds this morning, so I was lucky to have a dry view. 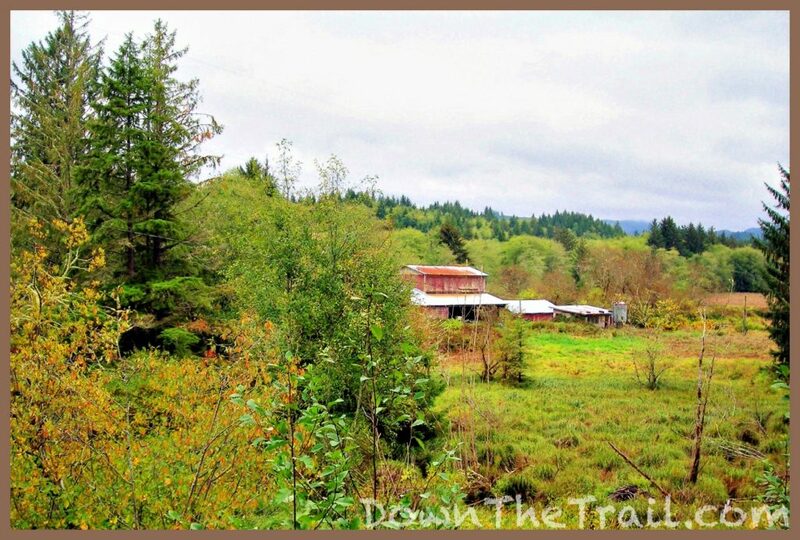 I circle down the steps from the tower, descend the hill, cross a river, and ride country roads along the Lewis and Clark River. I pass Fort Clatstop, one of Lewis & Clark’s winter abodes. There’s way too much stuff named after these guys around here. An Indian guide takes a leak on a tree, and 200 years later somebody nails a historical marker on it. The woods road is vacant and peaceful. 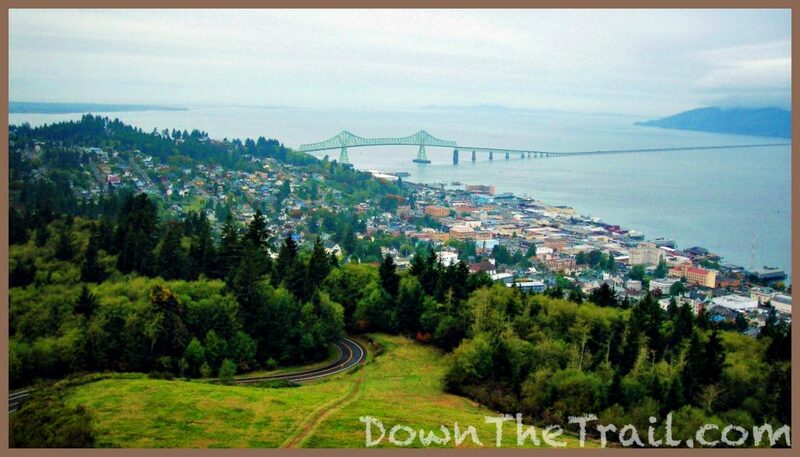 I climb a small hill, and coast out of the trees into Seaside, OR. Here I’m suddenly faced with the honest-to-goodness Pacific Ocean – crashing waves, sandy beaches, and route 101, with which I’m going to become well acquainted in the upcoming days. The rain starts again. I duck into another McDonalds, and spend some time on the phone with a friend. The rest of the afternoon is spent riding against the weather. Not only is it wet, but my thermometer reads 47 degrees. Headwinds blow in my face. Oh… and hills, too. And logging trucks. Yeah. Are we having an adventure yet? To me it may as well be a hurricane. 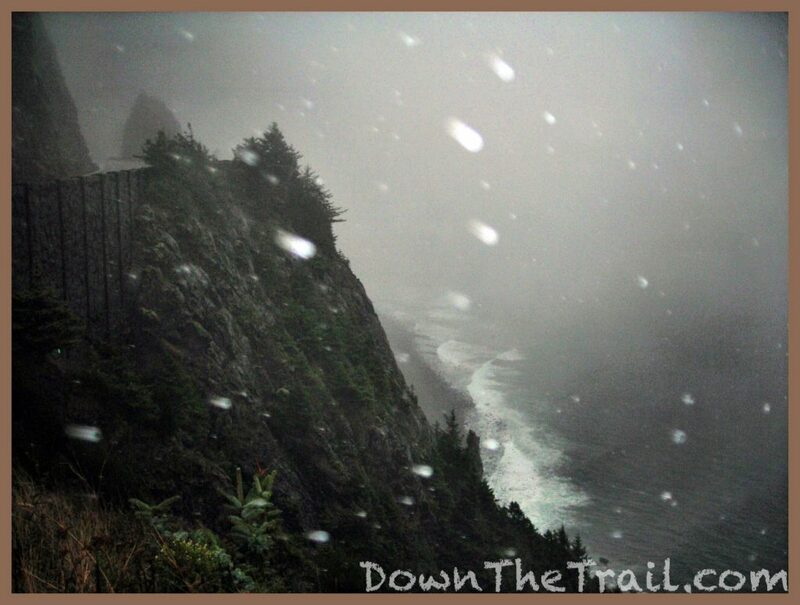 Through my foggy glasses I begin to see the rocky drama of the Oregon Coast, but everything is so obscured. At one point there’s a sheer cliff with waves rumbling below, and I’m sure it would look amazing on a better day. Oh well. Along the way in Arch Cape there’s an oasis of a general store. This guy knows what he’s doing – behind the counter there’s trays of fresh baked cookies and brownies. I get three chocolate chip cookies and coffee, and compliment the guy, “You have a nice set-up here. I mean that – I see a lot of little stores like this.” The coffee is that perfect temperature where it’s very hot but just barely tolerable. I gulp it down fast. Outside I meet two young men who look like they could be my friends if I met them in everyday life. “Nice day for a bike ride!” one says. I step back inside to throw away some garbage, and the guy is closing up the store now at at 4pm already. “Do you want some of these muffins? I’m just gonna throw them out.” I grab two blueberry – they’re soft and fresh – I would have saved them if I were him. 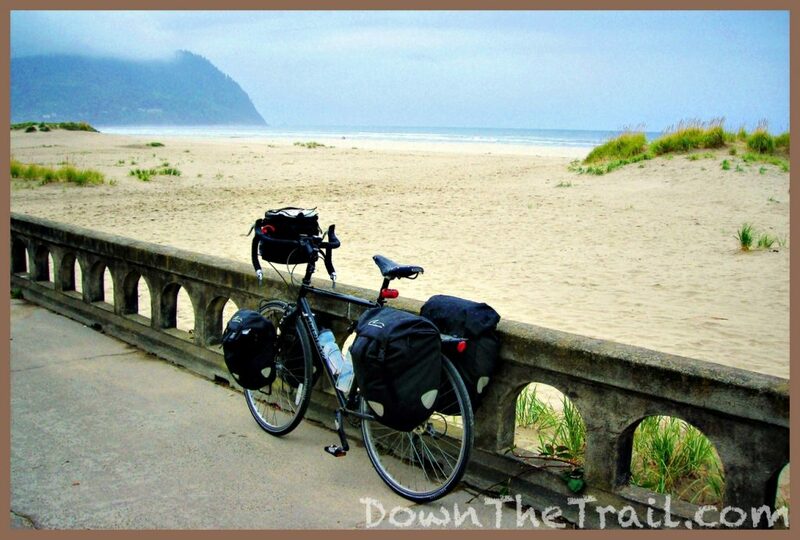 At last I make it to Manzanita, which looks like it would be a nice little town if the conditions weren’t so nasty. The cashier at the market laughs at my selection, “Vienna sausages and Ramen – reminds me of growing up in Hawaii!” I get a decent ocean-front motel room for 45 bucks, take a hot shower, and dry out. Having a room feels especially great tonight. Life is good.